Organic wholemeal rye bread with oats. This delicious, light wholemeal bread is made with organic oats and rye. It contains 1.1g of beta-glucans (from oats) per two slices. Beta-glucans contribute to the maintenance of normal blood cholesterol levels. To achieve a normal blood cholesterol level, a daily intake of 3g of beta-glucans is necessary. Two slices contain 33% of the recommended daily intake of fibre. 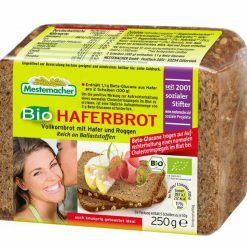 In its own mill, Mestemacher freshly grinds organic whole-grain rye, which is then combined with organic oats, organic oat bran and organic sunflower seeds to produce a delicious organic whole-grain bread made with sourdough. Rich in dietary fibre, it is healthy and can be enjoyed as a meal or snack with your favourite topping.